I’ve only recently learned to love a Bloody Mary. Maybe it’s a grown up drink and a sign I am getting old. 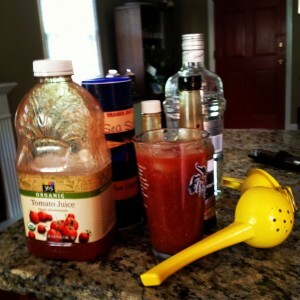 Or maybe it’s just that the Bloody Mary has been remade by the foodie crowd and no longer feature slimy V8. This recipe comes compliments of my friend from Brookyln, who, during a recent visit, made sure to stock our fridge with all the ingredients. tabasco (or another hot sauce). Fill a pint glass with ice and add 1-2 shots of vodka. Then, fill most of the way up with tomato juice. Add two or three good shakes worcestershire sauce, the juice of one lemon, salt and pepper (celery salt if you have it, or add celery seed in addition to the salt) and several shakes of hot sauce. Top that off with about a quarter to half a teaspoon of horseradish. 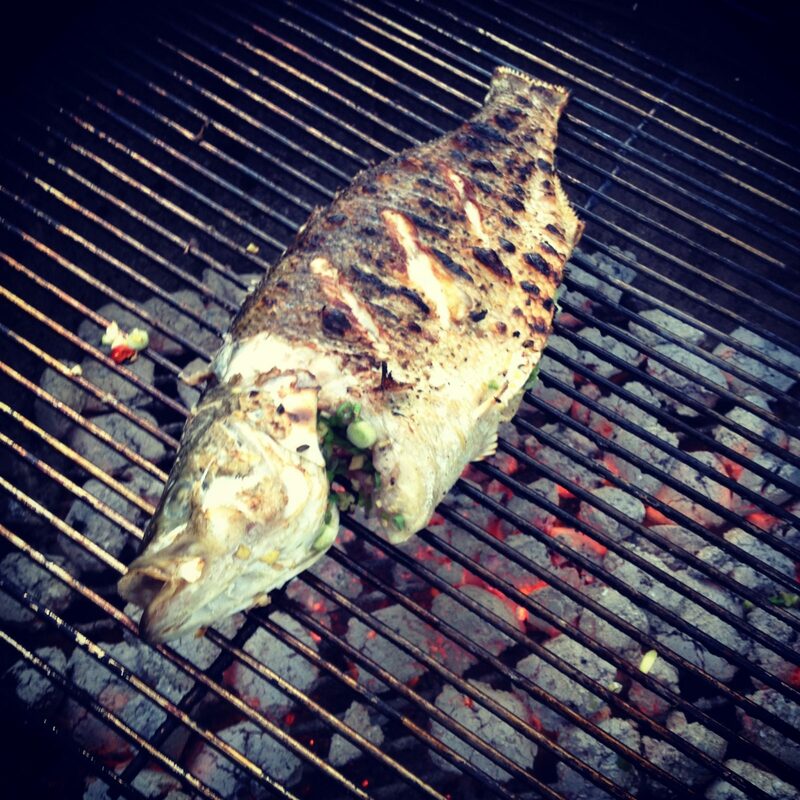 I love whole fish, and this is my favorite way to make it. The hardest part by far is finding a store that sells whole fish. I recommend the Chinese market Great Wall in Vienna, Va.
At Great Wall, you choose your fish from an impressive spread of sea food (that also includes sea cucumbers). Then, the butcher (fish monger?) 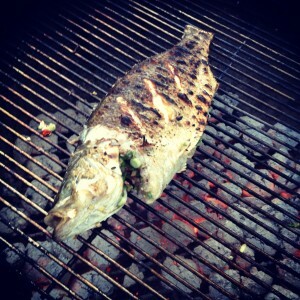 will prepare in one of a half a dozen ways, which range from just cleaned and scaled to completely filleted. We went with option #2, which involved getting the fins and tail cut off. Mince all your ingredients and stuff in the fish. Stick on the grill. Be careful not to flip until the side in fully done. You can’t see the other side of this fish, but he looks like he got into a bad fight with a lamprey. Avoid that. I think a plain white rice (or a pineapple rice, if you are adventurous) would have suited this dish better. But I wanted a side that I could transform into lunch for the next day. This recipe is a great one for that. Just add some grilled chicken breast to the top. Cook noodles al dente (do not overcook – mushy noodles won’t work). Strain and rinse under cold water until cooled. 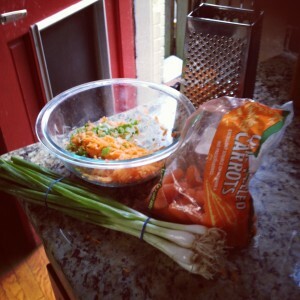 Mix together all “dressing” ingredients (peanut butter through garlic power)until blended. In large bowl stir together noodles, sauce and vegetables (reserve 1/2 chopped greens from green onion to sprinkle on top). Chill before serving.